It is hard to believe that five years have passed since 20+ local businesses got together to establish a local business network. The aim was to help each other grow the businesses, to refer business or give advice. In 2013 many businesses were struggling, so it was important to stand out in the crowd, to show that you were eager to do business. 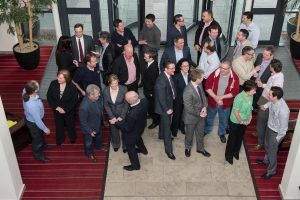 Pascal Curran and Michael MacGinty invited almost 200 local businesses to the first meeting to see if there was an appetite for such a network. At the first meeting 27 people turned up, with 54 people at the second meeting and so DBN was launched. fast forward 5 years and DBN has over 20 full members who attend weekly and many Lite members who attend once a month. Usually there are 3 or 4 visitors as well. Of the original members, about 10 are still here, including Pascal Curran from Advice First, Michael MacGinty from Meanit Web Agency, Garry Clarke Solicitor at Lanigan Clarke, Denis Finnegan from Finn Media, Bill Steele, Michael McMahon of CHD Insurance and William Keogh of Pinnacle Office Furniture, plus Tracy Peoples of Premier Services and Darren Donaghy of Donaghy Training have taken over those seats from Kenneth and Deirdre.